Ooh exciting news! 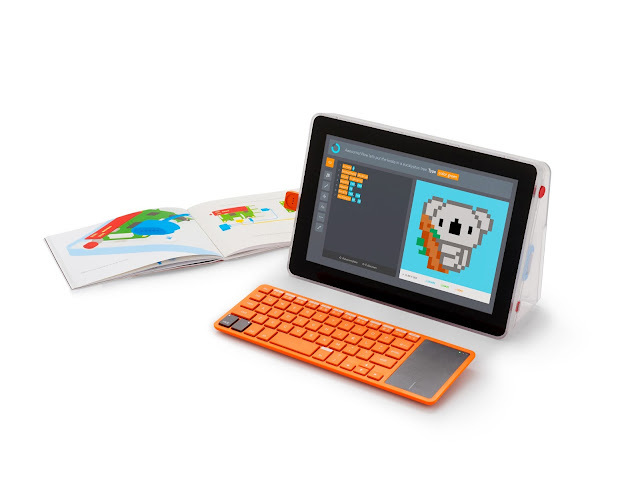 KANO have announced a new Raspberry Pi based complete computer kit for kids to put together. The KANO Computer Kit Complete combines a Raspberry Pi 3 (a complete computer on a single board), a rechargeable battery, a display, a case, a keyboard, a speaker and all the things you need to make them work together as a complete portable computer. Now we know that one of the advantages of the Raspberry Pi is that it's inexpensive and you can put together a complete computer cheaply if you have all the extra bits around. But not everyone does and in many families time is more limited than money. READ: Full hands-on review of Kano Computer Kit Complete. The KANO Computer Kit Complete makes it each to get all the bits you need in a single purchase. And the purchase price is quite affordable at: $249.99/£229.99. You also get stickers and a storybook which explains how to put the kit together. The Raspberry Pi is awesome for getting kids started with coding and physical computing (disclosure: I write content for the Raspberry Pi Foundation.) I'm often asked what you need to get started with a Raspberry Pi and for non-technical parents, it can be a bit daunting. For me, this product removes the initial friction from getting started with the Raspberry Pi. The Kano Computer Kit Complete is available for pre-order now with a release date of November 1st 2017, in plenty of time for Christmas. This post is just an initial heads-up. We'll go into more detail when we get our hands on a kit.